In the days prior to this race, I was trying to top off my electrolyte stores due to cramping issues I was having during training. 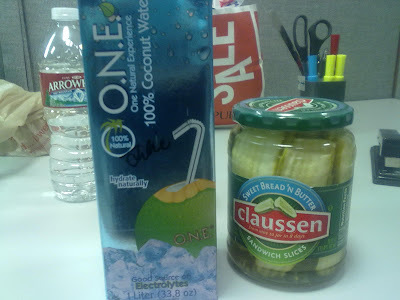 So I sipped on coconut water and ate pickles (didn't really drink much juice because I couldn't stand how it tasted this time around). I also got SaltStick to take prior to and during the race as a precaution. They were set up for a 5K they were having the next day, but I had class, so no go. Yes, I'd consider doing a 5K before a marathon -- just check out my plans for this May. Finally, we got to the Expo. It was large but very crowded, so I'd have to say I didn't get to see everything there. One good thing was that we got a TON of Expo loot! Totally justifies some of the marathon's $145 (+ Active.com fees) price... sorta! The cat is not part of the loot, but she wouldn't leave my stuff alone! Then, I got ready for bed and laid out all my stuff out. We had a 3 AM alarm in order to get to the pre-race shuttles in time, so bedtime was EARLY (even for me). On race day, we woke up to a rain shower, and we were worried that it might rain throughout the entire race because the weather websites told us that it was going to be a downpour in the second half of the day. From our past experience, especially my first marathon, we ran in almost the same conditions, so we were not too worried. We got to the pre-race shuttles pretty quickly, considering the weather, so we waited in Dodger Stadium for 2.5 hours, which gave us plenty of time for restrooms and creating anti-rain gear out of old race blankets from last year. We snacked on some Clif Shot Bloks and tried to stay warm. On the way to the gear check-in/corrals, I saw my sister... remarkably (and her co-worker). The race started off pretty well. I was taking it pretty easy because I knew there was going to be a nasty hill between Mile 4-5. Plus, I didn't want to waste all my energy and cramping up like last year. I was able to keep up a pretty decent pace throughout my first half of the marathon. I was very surprised at how many people were cheering along the route in their raincoats and underneath their umbrellas. At the water station between Mile 6-7, I said hi to my co-workers who were helping out and distributing Gatorade and water. In the second half, I slowed down a little bit because my shoes and socks were extremely wet, which made it hard to move my legs... because it felt like I was carrying 20 lbs of weight on my feet. Running through the puddles was, unfortunately, unavoidable because some of the streets were not able to support the drainage of all that rain that was coming down. Once I got to the last mile, which was Oceanside Ave., the wind REALLY got STRONG, but I was able to maintain my decent pace and completed the race in 3 hours and 25 minutes, right on the dot! My race didn't go as well. Without boring you too much, I will say that the rain was light in the beginning and got progressively worse. By the first 30 or 40 minutes or so, it was windy and pouring and pretty much stayed that way the entire time. I started off feeling really good, though. At Mile 9, I started to feel both my legs getting reallllllly heavy and then tight. At that point, I had to stop and stretch every so often to prevent VERY premature cramping. I fought the tight legs, wind, and my fatigue until I passed Mile 22. I had a few near-cramp episodes before then, but just as another one occurred, I suddenly heard, "Are you okay?!" It was my sister! "Yeah... cramping. I did everything I could!" I lamented, referring to my preparation mentioned at the beginning of this entry, plus all the training I had done. I apologized for not being able to continue on with her. My performance plummeted after that point, since I was getting tired, and the wind was aggravating my legs to spasm in places I've never had before. I walked pretty much most the rest of the way. At one point, I was SO cold that I went to a running club's tent to get a new wrap for myself, along with some fruit (I had been downing everything I could during the race to make sure I was hydrated and had electrolytes). They helped me SO much. Thank you to the volunteers that saved me out there! So many fruits and drinks! :) Also very grateful for those who contributed $$$ to my Japan fundraising campaign! Raised nearly $400! Here are my auto-Tweets that appeared during my race. Note the deterioration. Even leaving the race was painful. Everyone seemed irritable, pushing and shoving to get supplies afterward. I don't blame them. We were all super-soaked. Traffic out of there and on the freeway was jammed. I feel SO bad for "The Ukrainian," who waited for me outside the whole time. And here's the after shots.... trying REALLY hard to smile, believe me! Wow, I look bad... but at least alive. This was a long, long way off from my marathon PR, which I had been hoping to beat today. I was trying so, so hard to come in at least under 5 hours, which I was definitely going to do before those last few terrible ones. I somehow as able to run the last .5+ mile or so but almost had a painful episode 10 feet from the finish line, in front of everyone. Precarious! Unfortunately, the circumstances were just truly extraordinary, but I do have another chance in 2 months. I am trying not to beat myself up over it too much and just move on. Marathon #8 (#7 for "The Ukrainian") completed. My shoes were destroyed. And now, the power is out due to the bad weather. This will post when it comes back up. wow I would LOVE to run that marathon! I would so pay that price, hotels, etc. Hubs wouldn't be too thrilled tho. Its crazy how expensive some races are. This is the 2nd time I have heard mention of this race and its price. I guess when you love what you're doing its not as big a deal. Awesome pick for a race! Did you do this last year? Awesome awesome awesome course. congrats on finishing! it was a hard race bc of the crappy weather, thats for sure. The car with all of the participants' names on it is a really fun idea! Great loot from the expo, too. I love the mango coconut Soyjoy bars. Congratulations to you and The Ukrainian on finishing a tough race! I'm so sorry that you had to deal with cramps, especially from such an early point in the race. It's great that you're looking to the next one already. You'll get that PR! I was so happy when I saw you at mile 22. Unfortunately it was under such bad conditions. You are pretty tough for hanging in there like that. I mean on a regular sunny day, I could understand but yesterday was miserable. You should feel proud just for that. I was a jerk for leaving you there but I was also cold as heck and just wanted to get to the end so that I could change into warm clothes. That really was my motivation. Well that and wanting to rescue Karen from the water station. It was just an awful running day. No one should be running in those conditions. No one. For some reason this never showed up in my google reader... Going to read it now! This didn't show up in my google reader either! I can't believe you still ran in the rain. A 5-hour marathon in those conditions is impressive! It's still an hour faster than my PR. lol Rockstar. I might have to start eating pickles before races too. Good idea!! Love the kitty pic! I bet she provided much needed pre and post-race support! I have to ask...what does the pickle juice do?? Congrats on running a VERY difficult run!